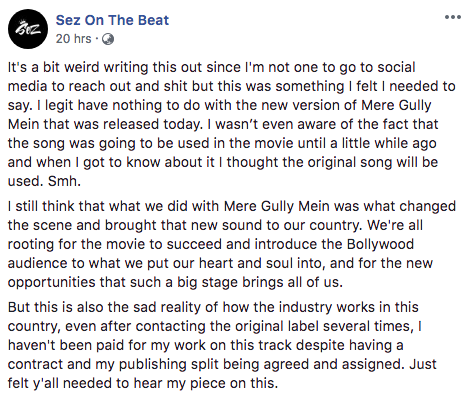 The original “Mere Gully Mein” song producer “Sez on the beat” had expressed his disappointment over the way both label and movie producers of the much anticipated Bollywood film “Gully Boy” have disregarded his contribution which started almost everything that the movie wants to represent. In an FB post (screenshot below), the hiphop producer wrote about how frustrating it was to realize the way our industry works and how the label has not paid him despite having a contract and publishing split being agreed and assigned. 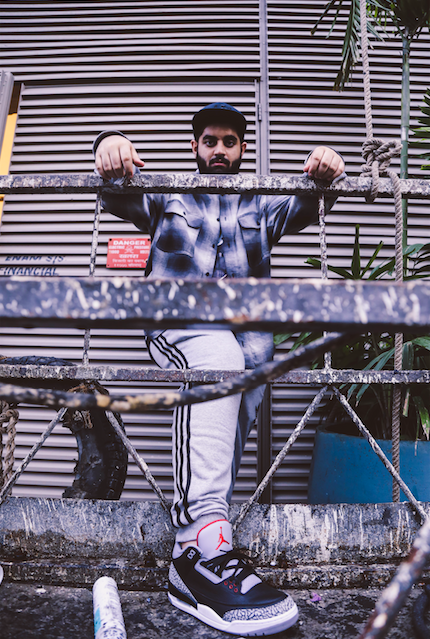 We contacted Ankur Tewari, the music supervisor of “Gully Boy” who enlightened us about how the movie production have been in touch with Sez and his management since yesterday. Sez is definitely getting the credits he deserves and along with IPRS guided royalties. Excel Entertainment and Tewari made sure that he gets the credits in the metadata on all digital platforms. The production house has also paid the label for rights of usage. Accordingly, they followed all procedures. He also expressed that he is not aware of the deal and equation between the label and Sez as that is outside the scope of the film. Tewari revealed that Sez has acknowledged their efforts thanking them for doing the right thing. We hope that the label will also take active steps in correcting the lapses in their commitments towards artists like Sez on the beat.